The article is given in the form of an interview. Here are the answers of SYSBIOTECH experts to the questions of scaling-up. What are the main problems of scaling-up in the transition from laboratory-scale to pilot-scale, and then to industrial-scale production? 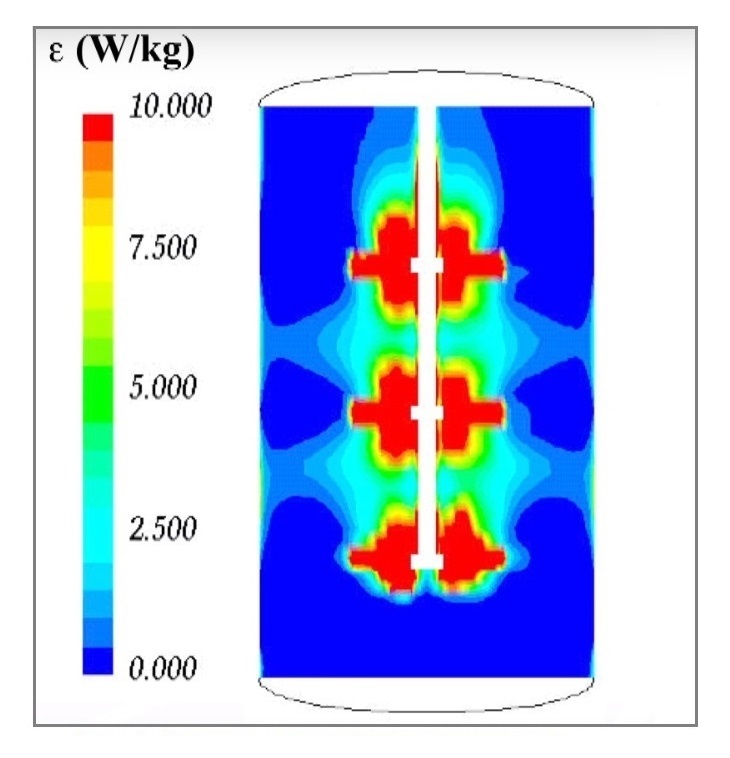 Energy dissipation in a bioreactor (model). When scaling-up the biotechnological process, the main problem is the difference in homogeneity between different scales, which is difficult to manage during process development, and which cannot be avoided. This can affect the quality of the process and/or the quality of the product. The hydrostatic pressure, which is higher at the bottom of the bioreactor, affects the gas solubility; mixing can lead to differences in gas and mass transfer. In addition, the liquid dynamics varies significantly on different scales, which creates a different hydrodynamic environment. For brittle mammalian cells that can be damaged in industrial bioreactors, hydrodynamic stress is the main problem, which is often discussed in the context of scaling-up. These problems can be solved using pilot bioreactors (also called ‘pilot fermenters for microorganisms cultivation’), similar in shape to the production-scale bioreactors. However, a small difference in form (and productivity, to some extent) between the steps of cultivation will be inevitable for purely technical reasons. At present, computer modeling is often used to perform scaling from laboratory to industrial. Various scaling criteria are used for computer modeling, including specific power input (P/V), impeller tip speed (Vtip), impeller shear rate (g), and specific mass transfer power (specific impeller pumping rate (Qs)), mass transfer coefficient, KLa. It is impossible to simultaneously maintain all variables at a constant level due to the limitations in the configuration of various bioreactors. Constant specific power (P/V) is the most commonly used scaling criterion. Based on your experience, does the scaling process facilitate such a technique as an improved monitoring of the parameters of the culture when running the process on a laboratory scale? How to realize this opportunity? All measurements of culture parameters that can be implemented on a small scale and which increase the understanding and control of the process can then facilitate the scaling-up process. In pharmaceutical production, this is achieved through the introduction of Process Analytical Technology (PAT), and the Quality by Design (QbD) approach. 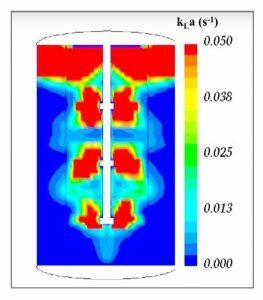 On the other hand, computational fluid dynamics (CFD) computational methods can be used to identify critical limitations in geometry for scaling, and simulate and optimize mixing, gas hold-up, mass transfer coefficients and gases distribution inside bioreactor. CFD makes it possible to simulate industrial fermenters of large volume using laboratory vessels. Currently, the market has many available sensors that can be easily installed in any bioreactor, regardless of its size. CFD is a non-intrusive method that can be implemented on an inexpensive glass laboratory bioreactor. What is more difficult to maintain at the proper level in the process of scaling: the yield of a product or its quality? Both parameters can create certain difficulties (depending on the specific process), but, for example, in biopharmaceuticals, if small differences in the product yield are acceptable, its quality should remain constant regardless of the scale. Identify the concentration of metabolites and determine the appropriate method of process optimization. Which of your products/services are suitable for scaling the biotechnology process? We can integrate data from third-party monitoring equipment into the C-BIO automatic control system.